$5 Shipping. Add $2 for each additional item. The SOG Revolver Knife, developed by Robbie Roberson and Spencer Frazer, is two fixed blades in one. Just depress the locking lever and rotate to bring whichever blade is needed to the fore. The SOG Double Action Revolver Knife features a 9.50" rotating blade made of AUS8 stainless steel, .150" thick, with a Rockwell hardness of 57-58. 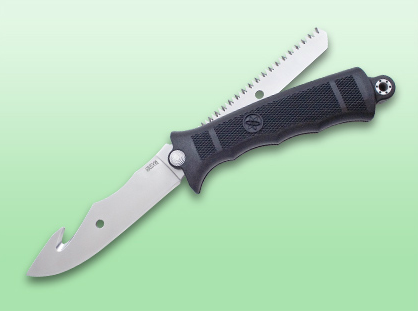 The blade has a 4.75" part serrated clip point half, and a 4.75" tanto half. The black glass reinforced Zytel handle is finger grooved, with dual stainless steel liners and a lanyard hole. The SOG Double Action Revolver comes complete with a Kydex sheath. The SOG Revolver Knife has an overall length of 10", and a weight of 6 ounces.